One of the classiest Chinese restaurants in Cardiff is located down at Mermaid quay in Cardiff bay. Beware: you may think you've accidentally wandered into an aquarium, as this place has a fish tank built into the full length of the bar! From its inauspicious looking exterior you might not expect this restaurant to be quite as grand inside as it actually is. The floor plan is huge and there are some beautiful water features built into the large glass walls. It also has a separate function room for private parties or conferences. 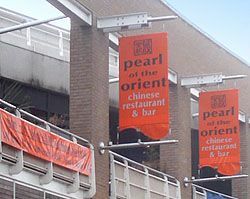 To call the Pearl of the Orient simply a 'Chinese restaurant' does not do it justice because they offer a variety of cuisines from all around the South East Asia region. All meals are flawlessly presented, with excellent, and prompt service. Set meals range in price from £14 upwards but the value for money is very good. The portions are large and the range of dishes on offer is excellent. The wine list is one of the largest I have encountered in Cardiff - so buy yourself 'Oz Clarke's Wine Guide' and know your sauvignon from your shiraz! As if all this isn't enough - they have a live pianist playing contemporary tunes to give the whole place a very mellow ambience. Top Tip: You must try the crispy duck with pancakes and plum sauce, it's absolutely delicious!